I knew Wendy Lichtman was a good writer (Washington Post, New York Times), but I never thought she (or anybody) could pull off a book so inventive and winning as “Secrets, Lies & Algebra” (HarperTeen; 183 pages; $6.99 paperback). It’s a great novel for young readers in the 6th-8th grades, but if you’re a math-phobic oldster like myself, it’s even better for mature(d) audiences. The story takes off like a rocket and before you know it, principles of algebra and even a little non-Euclidean geometry (I never heard of it before but now find indispensable) fly into your brain as though destined to reside there. We aren’t even aware it’s a teaching story about mathematics (except for the title) when the narrator, Tess, finds herself in the copy room at her middle school, where the first of two mysteries begins. However, when Richard, one of the cooler boys in school, pops in and asks Tess if he can “borrow the machine for a second” – and he’s standing two inches behind her while whispering this – against her better judgment she allows him in. It’s not that she has much choice. Tess may be good at math and dress okay, but Richard is “extremely good-looking” and a basketball star at that. Then there is the matter of how these two are ranked by everybody else, and this she describes as a mathematic formula. This is the first and simplest reference to mathematical symbols, and LIchtman is such a good teacher that it encourages us to anticipate more. Tess will bring up that > and < method of measuring later on, so we’ll get used to the way her mind operates, and gradually we’ll absorb more complicated formulae. Lichtman could have let the theft of a history exam dominate this brief story, but she’s so adept at fiction at this level that she weaves in a delicious murder mystery as well. When Tess gets home, she finds her mother in tears over the suicide of a friend named Nina, who apparently died of carbon monoxide poisoning when she sat in her car with the garage door closed and the motor running. Nina’s husband, Rob, a sculptor who works with Tess’s mother at Art4Kids, where they both teach ceramics, does not seem all that broken up over Nina’s death. In fact he has blurted out things that made her mom suspect Rob of killing Nina and then placing her body in the car to make it look like suicide. Against that backdrop of suspicion and plausibility, Tess again turns to algebra as a reliable, organic system for figuring out life’s toughest problems. 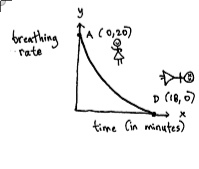 When her mother is too upset to talk more about Nina’s death, Tess takes the little information she has and works up two nifty graphs to ponder the possibilities on paper. First, she considers the timing, because it’s important to know, if the cause of death was suicide, whether Nina took a long time or a short time dying. It takes only a few sentences before Tess explains to us how graphs work and why new insights can be gained by studying life through a math lens. The illustrator (not Lichtman but a really with-it artist at Harper) is adept at combining the kind of doodles that a middle-school student might make (note the Xs for dead Nina’s eyes) with easy-to-understand math exercises. Not only is Tess’s humor brought to the page, we see exactly why algebra can apply to real life and be entertaining at the same time. 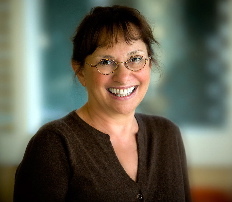 A big bonus to the book allows us to watch Tess’s gifted algebra teacher, Mrs. Salzman, pass on to students (and now to us) her own fascination with such concepts as imaginary numbers, Venn diagrams and the difference between an axiom and a theorum. The other bonus is watching Tess’s parents and her two best friends reap the benefit of Tess’s “Math Whiz” mind (she gets an award for this) when she passes on her math-minded view of the world. Of the thousands of math concepts I missed in school, for example, I never heard of DNE, which means that in some calculations, there is no answer – it Does Not Exist. This simple idea is not only a math lesson but a fact of life that has tremendous value before everybody in the book jumps to false conclusions about who murdered whom. Pretty soon the language of mathematics grows less codified as Lichtman leads us numbers-avoidant readers from the simple to the complex, which is to say, easy to difficult. Eventually we stop translating the symbols because our newly educated eye absorbs their meaning quickly, almost effortlessly. For example, what might have been an esoteric scribbling to the lay mind causes us to nod sagely when we realize that Tess is very close to figuring out who stole the history test. All of this is conveyed in the kind of teen-speak idiom that ordinarily drives a 64-year-old nuts (awesome, whatever, like, cool, weird, freaked and every variation of are you serious?). But here Lichtman sees beyond passing trends and need for conformity to the growing individualism of each of her characters. Even the history teacher offers an unforgettable lesson in the Bill of Rights, although Tess recognizes that he’s something of a Mr. Malaprop when it comes to misusing everyday words – especially those taken from the world of mathematics. For example, he’ll say, “Class, this test is of infinite importance,” when everyone knows – well, Tess knows – that “infinite” means immeasurable, not just a lot. The pages fly by as we hunger to know: Will Tess solve the two mysteries or will she get bogged down in extraneous solutions (the math equivalent of red herrings) because the boy she likes (not Richard) may have a crush on her? Or is it all one big DNE? Note to readers: I thought it would be fun to take a break before my next mouthing off with #3 of “Three Things I’d Love to See,” coming up soon. It’s the holiday season, after all. 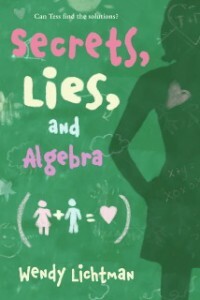 If you are a parent or friend of a middle-schooler who’s about to take algebra (or has just started), “Secrets, Lies & Algebra” makes a great gift. I can’t wait to begin Wendy’s next entry in the adventures of Tess and her friends, “The Writing on the Wall” (Greenwillow/HarperTeen; 216 pages; $16.99 hardcover), where mysteries and algebra get more complicated, thank heaven.